Urine Expert is a new product from the authors of JESS. Urine Expert computes the solubilities of key minerals in urine, including common stone-forming minerals apatite, brushite, octacalcium phosphate, whewellite, and weddellite and rarer minerals containing magnesium, ammonium, phosphate, sulfate and urate. Urine Expert features a convenient and easy-to-use graphical interface (Figure 1) offering immediate practical results (Figure 2) from a powerful chemical speciation model. Figure 1. Inputs to the urine speciation model. Figure 2. Outputs from the urine speciation model. 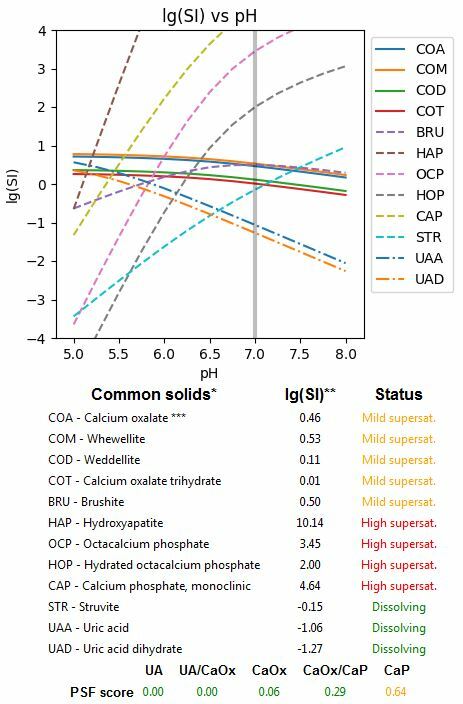 Saturation indices (as lg(SI)) are reported for over 40 minerals. Urine Expert is made available to non-commercial users for a nominal fee. Contact Peter May for more information or to obtain access. View some of our other new products here.